I am from Perth and work with clients locally and around the globe. I’ve been in the floral industry for 20 years. In 2010, my friend’s summer wedding was coming up and I was asked to create the floral elements. The night before, I could barely sleep from nerves and excitement. The freedom to create and work so closely with the bride to make her vision a reality was the turning point for me. Working on my friends wedding showed me that connection was the key to making my floral arrangements become so much more than just flowers. I finally knew what I was meant to do after years of working with florals. That moment I see my bride’s face light up when seeing her flowers is incredible. It’s hard to put into words how much I love what I do. At Wildwood Floral, I use organic, natural blooms to complete a brides’ vision. Through organic arranging and personalized services for each project, I bring my true love of flowers and interpreting a bride’s story into her wedding day. When you’re creating a once-in-a-lifetime experience, you need elements that feel connected to you and your groom. My passion for florals doesn’t stop at weddings. Even when I’m not working with my brides, I have my own garden where I grow flowers that aren’t easy to obtain here in Perth. Getting to watch a seed become a bloom I can use in a bride’s bouquet gives me an extra level of joy when working on my weddings. When I truly take a break from work, I spend time with the three loves of my life. My partner of 19 years, Dawn, is the best floral assistant I could ask for. She supports my crazy dreams and never complains when I need her help. We have two of the sweetest dogs, Rufus & Honey, who are with me wherever I go. They’re even my companions at the flower market, often getting cuddled by complete strangers. I am a person that is driven by spirituality. Love guides me through life and makes me excited for what is to come for me. I’m a reiki practitioner and yoga enthusiast, connecting me even further to my spiritual beliefs. "How could thank you be enough for all that you did for our wedding? We adored the flowers, the marquee, our beautiful bouquets, everything ! It was wonderful to have you involved & we are so grateful & lucky !" " Where do I start … perhaps with a very big THANK YOU! Those blooms, that room, the spectacular arbour & one heck of a chandelier … it was pure magic. I cannot tell you how many people commented on the flowers & asked who was responsible. It was my privilege to say the remarkable Jane at Wildwood Floral. My apartment & our parents houses are still delicately scented with an absolutely gorgeous perfume!" "Thank you so much for the stunning floral creations for our wedding day! The flowers were absolutely beautiful, the perfect addition to a most wonderful day!" There are no words to express how eternally grateful we are for the magic you created on our wedding day. 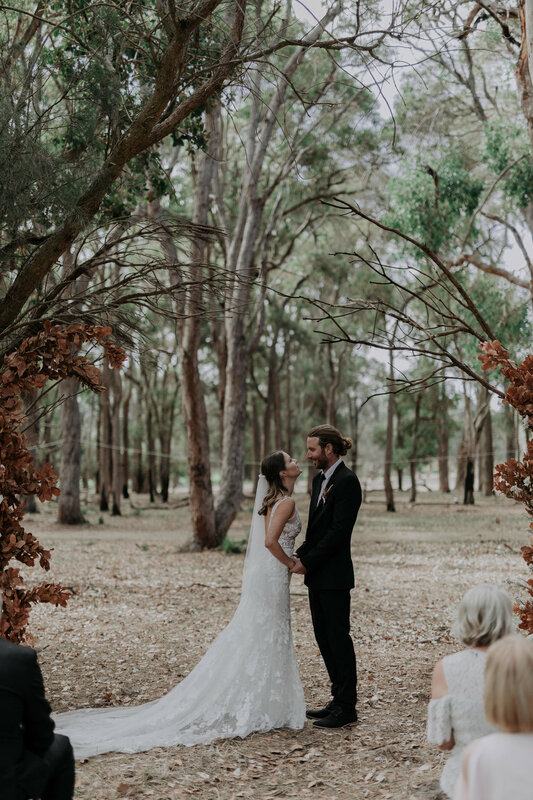 We were married in our very own floral wonderland. There is no one else I would have trusted to bring our wedding floristry dreams to life. You are the most incredible artist. We’re forever thankful. Feel free to get in touch and chat about your requirements. We’d love to be involved in your upcoming wedding.